It's been great to meet so many Login readers at Code Conference. And, to the rest of you, wish you were here. That said, hopefully I can help you feel like you were, with a quick recap. Two of the most eagerly watched startups in tech, Uber and Airbnb, both indicated yesterday that they may go public in 2019. 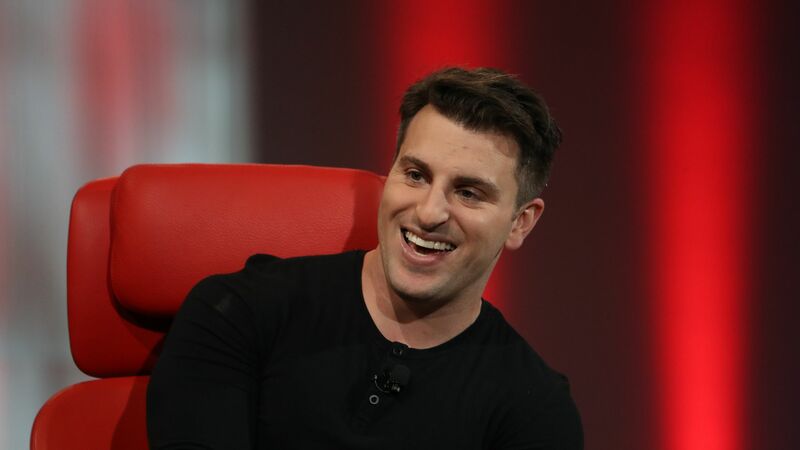 Airbnb CEO Brian Chesky said Tuesday that his company will be ready to go public next year, though whether it will do so has not yet been decided. "I want to make sure it is a major benefit to the company if we do... It could happen," he said at Recode's 2018 Code Conference in Rancho Palos Verdes, Calif.
Uber CEO Dara Khosrowshahi expressed similar ambitions in a CNBC interview and on stage at Code, though he was less equivocal. "2019. Second half," he said, adding, "I need a CFO though." Interviewer Kara Swisher suggested he find the right woman for the job. "I don't know if it will be a woman or a man, but I am going to make damn sure I look at both," Khosrowshahi replied. Why it matters: Private financing has way outpaced IPO fundraising in tech since the '90s, as shown by one of Kleiner Perkins partner Mary Meeker's slides. But despite the rise of private billion-dollar "unicorns," and a growing concern that publicly traded companies sacrifice long-term vision for short-term concerns, IPOs remain the tech business's holy grail. After all, IPOs can transmute the blood, sweat, and tears of startup labor into personal wealth and give VC firms the exits they need to help fund their next round of startup investments. Meanwhile, two fairly recent IPO companies, Spotify and Stitch Fix, shared their lessons learned. Spotify CEO Daniel Ek talked about being punished by Wall Street for only matching earnings expectations in its first public earnings report — even though it had given guidance just 10 days before the quarter's end. Stitch Fix CEO Katrina Lake shared her experiences, expressing regret that expectations got so far ahead of the company, especially since its $1.5 billion valuation was far more than the $300 million valuation it had when it had last raised money. Using UberX and UberPool lowers weekly commuting costs for customers, compared to owning a car, in 4 of the 5 largest U.S. cities, according to one of the 200-plus slides that Meeker shared during her annual "Internet Trends" report on Wednesday. Why it matters: Ride-hailing companies' lofty claims about their impact on transportation have often been met with skepticism, notes Axios' Kia Kokalitcheva. Meanwhile, in China: On-demand car and bike rides continue to grow, and rides in China now make up 68% of global demand, up from 67% a year ago. But, more staggering is that this represents about 5 billion completed trips quarterly — up from only 2.5 billion trips per quarter a year ago. Plus: You can see all of Meeker's slides, and our take on the key points here. Beyond IPO talk, Khosrowshahi said that the company has had talks with Waymo about having its one-time foe put autonomous vehicles onto Uber's platform. Sen. Mark Warner spoke out against President Trump's move to ease sanctions on China's ZTE. AT&T CEO Randall Stephenson took pains to avoid commenting on the court fight over Time Warner and what he would do if the deal was blocked. He did, however, offer some thoughts on T-Mobile's deal to buy Sprint. Three of the leading women in tech offered their thoughts on how Silicon Valley could improve its diversity. Yes, but: Throughout the event there was widespread speculation that Tesla and SpaceX CEO Elon Musk might make an unscheduled appearance on stage. Swisher had been using her considerable persuasive powers (and a public Twitter push) to convince Musk to appear, but to no avail. Reality check: The shareholder proposal doesn’t stand a chance of getting approved — and the current FTC isn’t interested in breaking up Facebook. Plus, for replacing Zuckerberg in any capacity, that's also a non-starter as he maintains voting control of the company. Still, this is the start of what could be a sustained campaign and drum-beat behind the coalition’s calls for more regulatory action and new accountability measures. Go deeper: Read Kim Hart's full story here and David McCabe's piece detailing the coalition's launch earlier this month. The revolutionary thing about Personals isn't that it aims to be a dating app focused on people who identify as LGBTQ. It's that it wants to be a dating app that eschews pictures in favor of text-only ads. The bottom line: Personals harkens back to the day when people met via personal ads in newspapers, while still taking advantage of the ubiquitous smartphone. Its creators aim to launch in the fall and you can sign up for the beta here. Go deeper: Them. has a detailed write-up on the effort and its origin. Augmented World Expo continues in Santa Clara, Calif.
VMware reports earnings after the markets close. Box added Micro Focus executive Sue Barsamian to its board of directors. The online storage company also posted better-than-expected quarterly earnings. Univision is replacing CEO Randy Falco with former Media General CEO Vincent Sadusky. Valve did pull the planned release of a game called "Active Shooter" after backlash, but Fortune writes we should read the fine print. Jurassic World Alive, which has been dubbed a "Pokemon Go with dinosaurs," launched out of beta. (It's based on top of Google Maps vs. Niantic's game engine). Zynga is buying Turkey-based Gram Games for $250 million in cash, VentureBeat reports. GM today announced that SoftBank Vision Fund will invest $2.25 billion into its self-driving program, with plans to commercialize the vehicles next year. Intel closed out Day 2 of Code Conference with a pretty fun drone show.